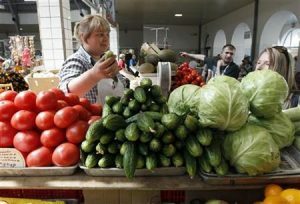 Russian crops are rich in vegetables, since they are fond of it. Besides, their family tradition has preserved the tradition in serving any kind of meals which contain healthy vitamin from vegetables. Wide varieties of vegetables are used almost in every kinds of dish, from soups, salads, appetizers, pies, meat dishes and fish dishes. Along with the real popularity of vegetables for Russian, they also grow many kinds of vegetables in special garden –dacha- far from their home. So, if the summer season has come, the people will move temporary to the dacha and plants fruits, veggies, crops, berries etc to provide their family with enough food supply during harsh winter time. In other word, vegetables are really appreciated in Russia and grown in large quantities, since almost every day even in summer and winter the family dish must contain vegetables in it. In fact, turnip is the original vegetable in Russia. It was so popular and really appreciated by the Russian old generation back then in the 17th century. At that time, the turnip became the main food source for villagers. Until the introduction of potatoes in the 18th century by the local government then it became less popular. The existence of turnip in Russia is still widely spread across the country. The vegetable can grow well in Russian climate and it is very easy to preserve. So, for those who want to buy this delicious veggie, they can just go to the nearest market or visit Russian garden for fresh turnip. The season of turnip is in the late summer, you can eat it raw and taste the sweet flavor. Or simply make it into steamed turnip which is full of vitamins. Other turnip creation is turnip soups and stews, besides you just can make it into smoked turnip. Yummy and your kids would love it. Cabbage is another famous Russian vegetable. It was first introduced by the Greek Roman seller through the Crimea city. The history noted that it was originally known since 11th century. At that time, cabbage is used for the medical treatment, since there are lots of advantages if you consume it. They are good for improving your intestine’s work, it also contains favorable kind of flora which can win the bad ones, and last it has such good effect to lose the cholesterol. We can easily find the cabbage grows in all over Russia, especially in the summer season, as it grew quickly and did not require a lot of special treatment. And for your information, there is a special garden to preserve cabbage which is called “kapustniki” where might surprise the visitors with the countless number of it. The way to choose best cabbage is by looking at the freshness of it, the fresh one is the better. Russian people will absolutely make this cabbage based dish into their family menu. So, do not be surprised once you visit one of your Russian friend’s home and you find sauerkraut, shchi, stewed cabbage, borscht, and pierogies. Believe in Russian, all of those dish are delicious and of course contains high vitamins. As for the winter food supply, they will make it into pickled cabbage for serving in the table. That’s why I am not exaggerating to tell you the fact of how Russians do love cabbage. Russia has the most suitable climate and soil to grow beets or also known as sugar beets. This is proven by the total number of production which can reach 45 million tons, later followed by France and United States of America. This veggie contains a high concentration of sucrose, in which is used for making sugar. Besides, it also important for people’s energy comes from sweet taste. Beet consists of two parts; the tops and the roots. The way to cook the tops or upper parts are cooked or served fresh as greens and for the lower parts or the roots may, you might make it into pickled for salads or cooked whole, then sliced or diced. You must have heard that Russian is famous with borscht soup, and beet is the main ingredients of it. Although beet actually can grow everywhere in the world, but the thing is that it was originally known in Russia in 10th century. and it still became the nation’s famous vegetables to be served along with any main dishes. Potato was not originally from Russia, but it was brought by the seller from the Europe in the 18th century. However, the popularity of this vegetable rise quickly and soon became nations popular in every dish among Russian family. Since that period, people start to grow their own potato in their dacha so that it can supply for family foods. And most surprisingly, now potato has become a special staple crop in the country. The way of preserving is also not so hard plus the vitamin in it is very useful for the health. The creation of potato are very diverse, you can just barely make potato steam or make a mashed potato, as for the dish ingredients, you can make a variety of soups, appetizers, main dishes, bake, donuts. For the food combination, you can add or combine with other vegetable, fish, mushroom and even meat. For those who can not effort to grow potato themselves, especially for tourist, just go to the market and ask the seller about the fresh potato. They must provide with the best stock since it’s the national staple food which is loved by every people. For the fact information, Russia is the world’s second largest potato consumer after Republic of Tiongkok.